Marimo balls are a type of spherical fresh water algae from Lake Akan in Japan but are also found in Europe, USA and Russia. The spherical shape occurs in nature by water currents flowing over the Marimo and causing it to tumble on lake beds. 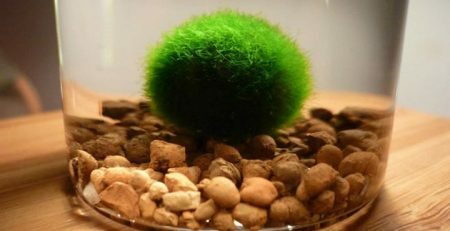 Marimo (meaning ball seaweed), have become a kind of national treasure to the Japanese who are known to appreciate form and function of which the Marimo ball has in abundance. Beautiful to look at, these slow growing living organisms increase in size by 5 mm over a period of one year. Covered in smooth green filaments they have a luxurious velvety appearance. 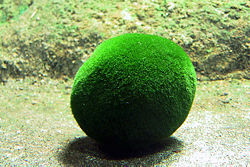 Domestic Marimo balls do not need special aeration or filtration. 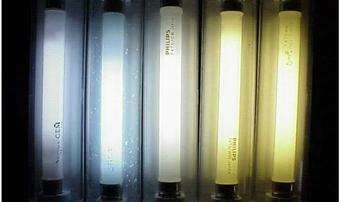 However, fish tank filters may become clogged due to Marimo filaments being sucked into them and rendering them ineffective. Filters should be cleaned regularly. 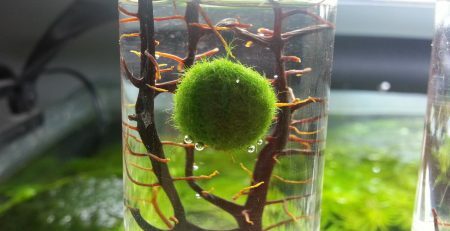 When caring for your Marimo ball, run the moss ball under the tap to remove any debris and squeeze gently. If white spots have occurred, gently cut them away removing as little of the moss ball as possible to prevent permanent damage. 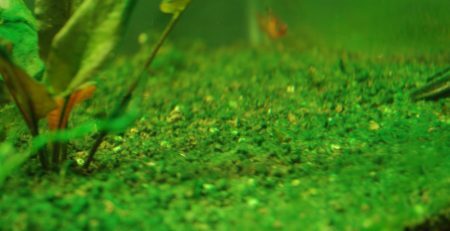 Once returned to the tank the moss ball may temporarily float at the surface. 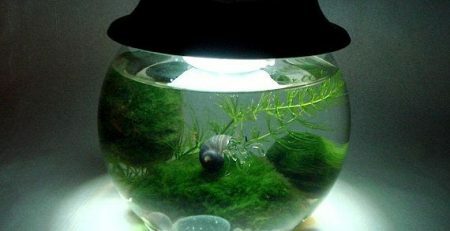 After photosynthesis occurs with normal household lighting the Marimo ball will sink to the bottom of the tank. 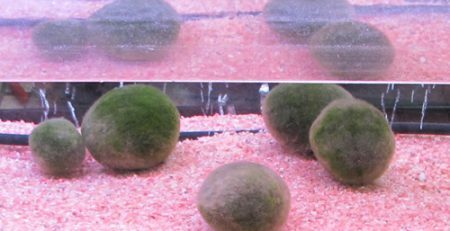 Tap water at room temperature provides the minerals Marimo balls need (leave tap water to sit overnight to release chlorine) and should be changed weekly in summer and bi-weekly in winter. If the temperature of the water gets too hot, the green filaments will begin to turn brown and the water should be changed or refrigerated to bring the temperature down. 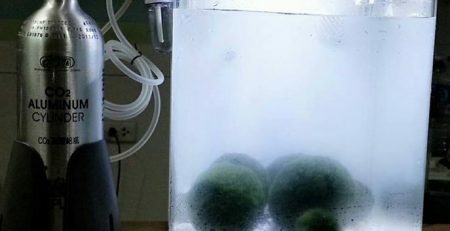 Marimo balls cannot be frozen. Marimo balls are often used as an added filtration device; as they absorb nutrients and algae. This potentially reduces the need for chemicals that can be potentially harmful to fish. 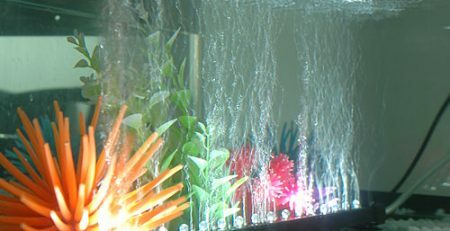 Goldfish and bottom dwellers may nip and pull apart the Marimo ball and add to the filaments sucked into the filter. 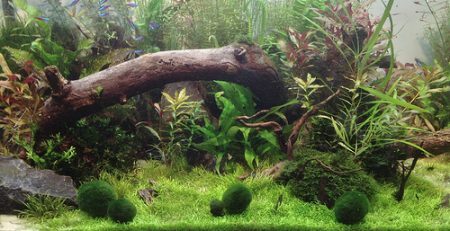 Therefore a good companion fish would be the Guppy and the Beta as they tend to leave the moss balls alone.